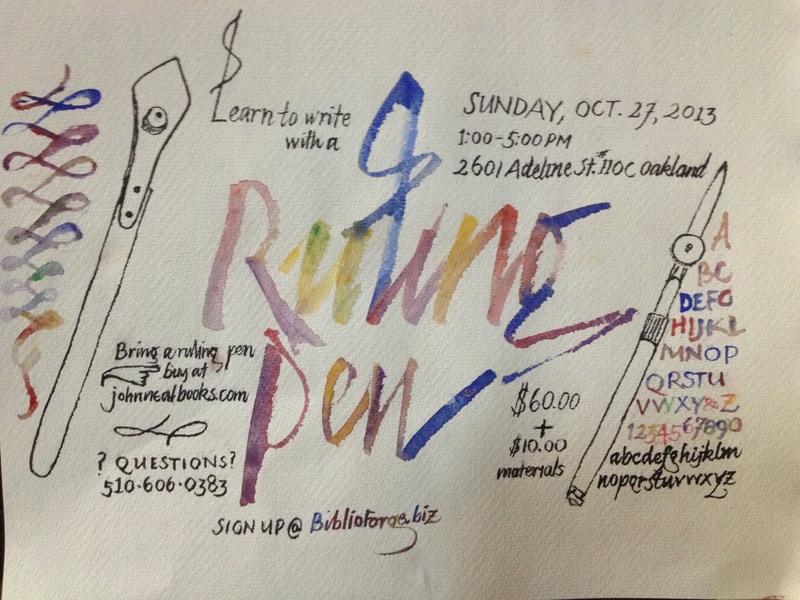 I’ll be teaching a workshop on how to use a fun calligraphy tool – the Ruling Pen. For the last 80 years, scribes have been using this “new” writing instrument to express themselves by making letters that break away from the broad edge pens of past scribes. The pen makes its mark by being pulled and the ink is dragged out of the side of the instrument. One can vary width by what part of the instrument is being dragged across the surface – sideways. Using the pointed tip gives the scribe the chance to make small, fine letters. Working with the side of the tool, greater width strokes are possible. Because the color is pulled out the side, there is greater inconsistency to the edge of the letterform. Add a rough-textured paper and the result is an even coarser edge. Often, splatters appear on the paper as the color is flung out when the pen is drawn across the uneven surface. All skill levels can take this workshop. This workshop will teach how to use the tool, adding color and working it to greatest advantage. Students can use their own handwriting or modify calligraphic hands that they’ve learned. The workshop is $60 for four hours of instruction and practice. 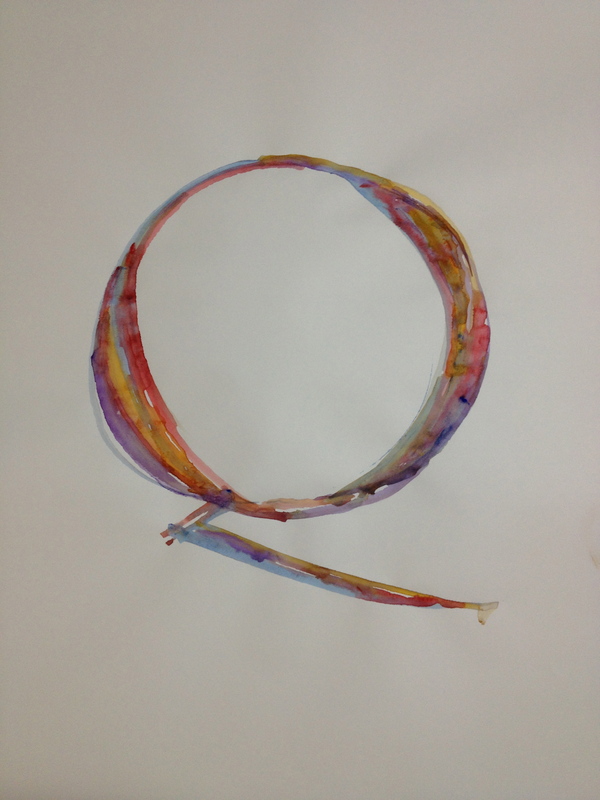 The $10 fee supplies paper, ink and gouache colors to use in creating your written art. We will experiment with different papers to understand how to exploit the tool’s unique mark-making characteristics. The positive defines the negative – that is how letters work. Manipulating that relationship never gets old for me. 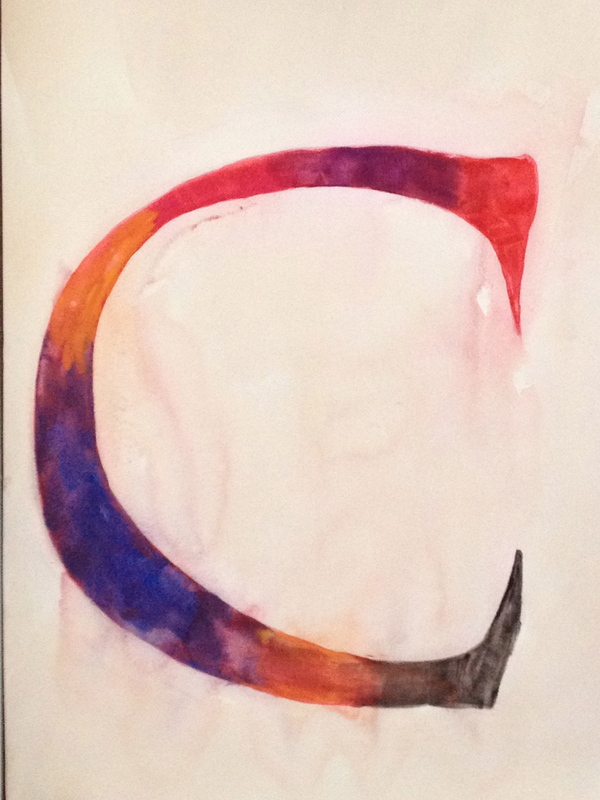 This big ol’ C was fairly simply and directly made – a few colors painted and blended on a large sheet of paper. It got a little interesting when I sprayed water on the painted surface and let it bleed. There’s a three-dimensional quality that comes about in the staining that is far greater than on the paper itself. After talking with a few artists, I decided to move up to paint. 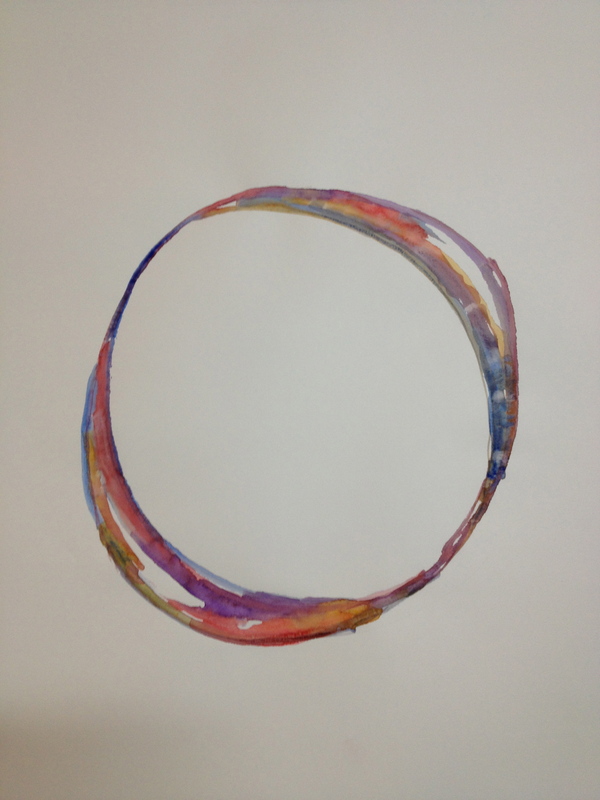 Starting with an “open” acrylic, I gave it a try on a manufactured gessoed 12″ wooden panel. I was surprised at how easy it was to work with the color and how well it responded to watercolor technique. And this one – where the negative becomes positive, leaving the B shape as the background. With a little staining, once again. For some reason color bleeding into the white space attracts me. 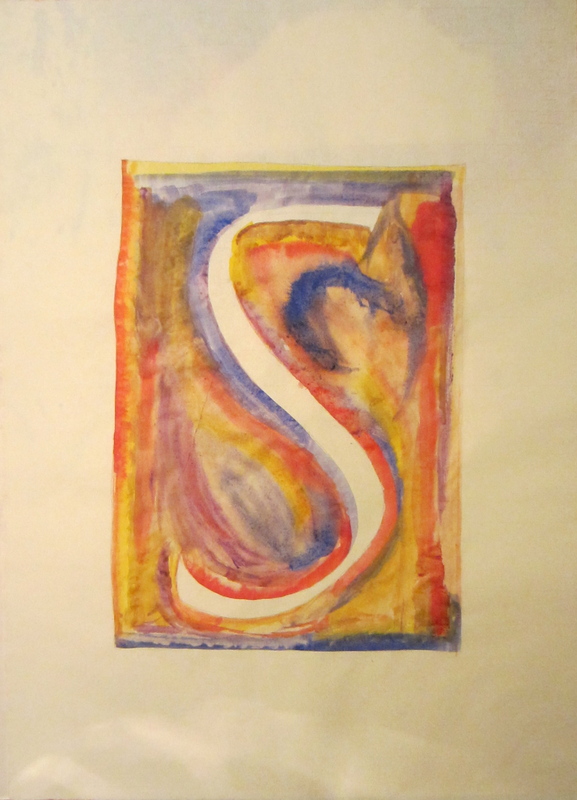 Letters – in the world of calligraphy and type – come in families. There should be a resemblance to the one next to it because legibility is measured by the repetition of similar patterns and shapes. When a letter doesn’t resemble one next to it, reading comprehension is lowered – it takes longer for the eye to recognize the negative shape of one letter if it isn’t in the family of its surrounding forms. 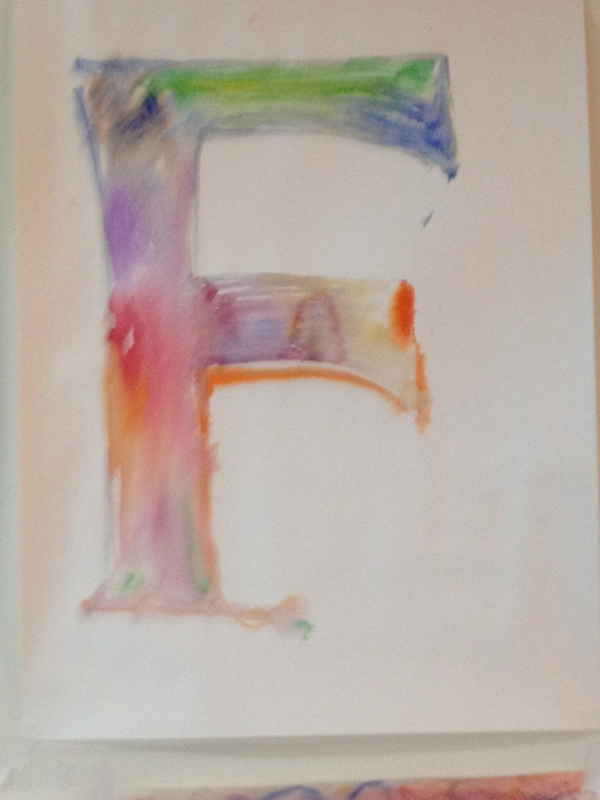 I’m not trying to make a family of letters to be put together to make words flow together, easily read. 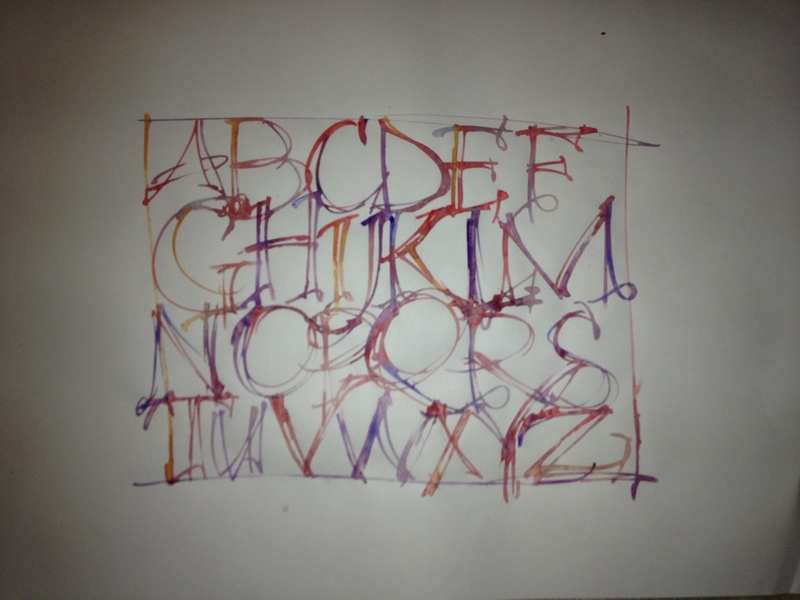 My exercise has been to focus on each letter as if it were independent of its day job. These letters stand (mostly) alone in their finest or most outrageous garb. 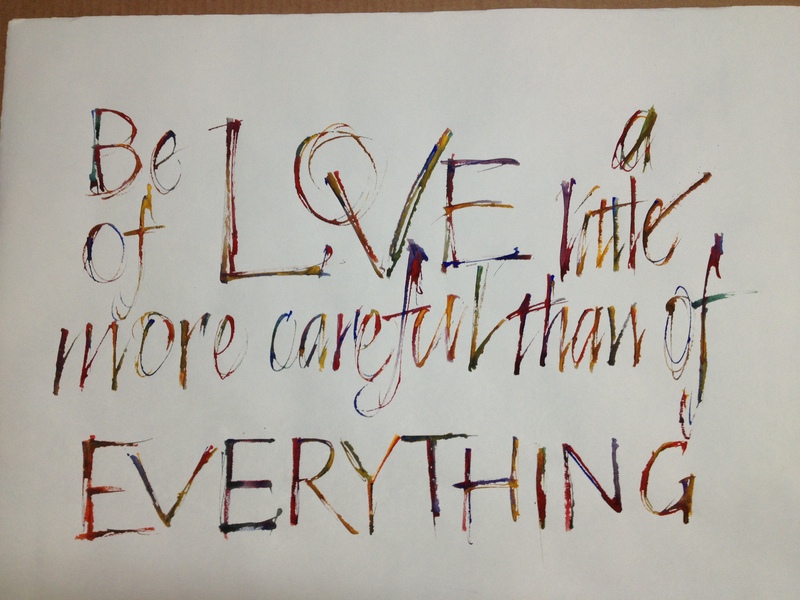 Maybe they’re a little skittish, or excited or they might be understated and simple. I come to the page and watch them develop in front of my eyes, like a dresser that is guided to do their bidding. I have been suffering a 2 month long excema bout that has left me in quite a bit of pain and unwilling/able to write or do much of anything. It appears to be on the wane, so I can return to more pleasurable pursuits like writing. I have been wanting to make a portrait letter series since the millenium – thirteen years is a long time for an idea as simple as this to come together. At the beginning I wanted to make 26 parchment surfaces because I have made vellum and wanted to get back to it. 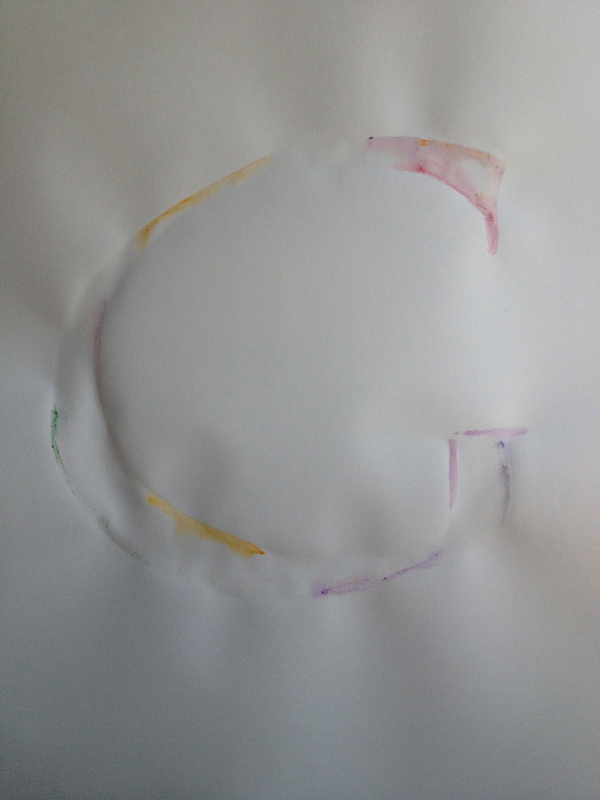 Some people make their own paper for their art, I wanted to make my own parchment. That was the first hang-up, and a good one because it masked my fear. And my fear was that I can’t make large letters all alone and have them look interesting. 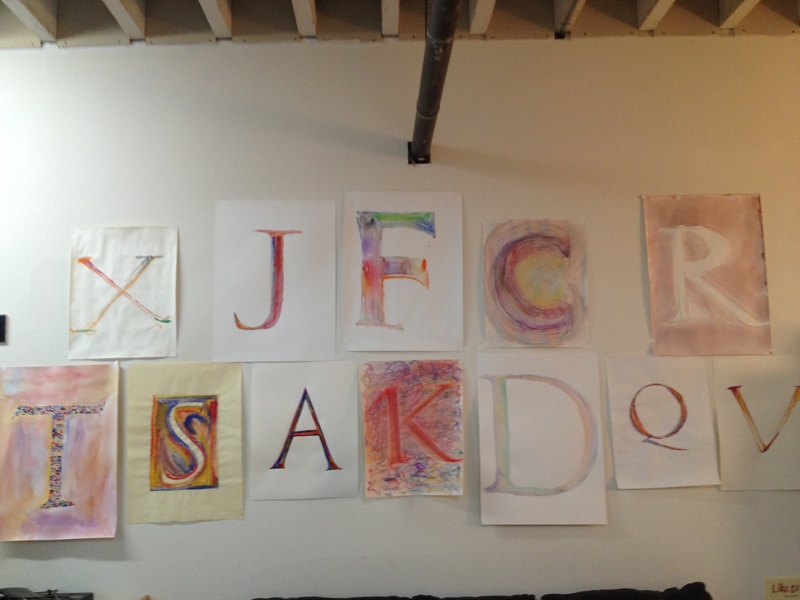 Some of these letters are nothing more than sketches. But they show that I can make big letters. 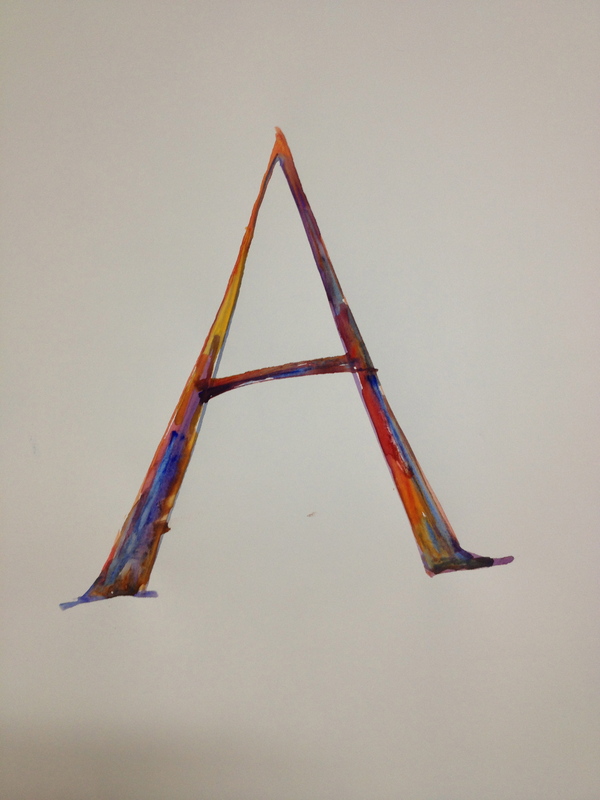 I know, it doesn’t seem like much – making a big letter shouldn’t be any more difficult than making a small one. But changing the dimensions this much creates challenges. Challenges that I didn’t think I could overcome. The S below is about 17″ tall. I did this last year but felt like it was a little rough – doing the color washes was not all that satisfying because so much area had to be covered and painted in while wet. Technical limitations aside, I wasn’t happy with the image when seen on the wall. 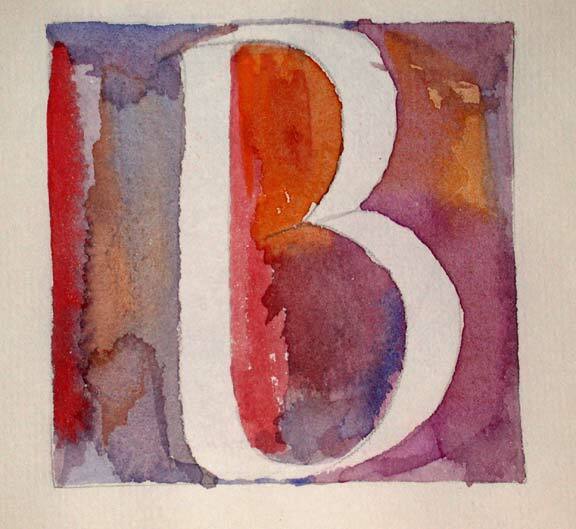 Below is the B that I use as the thumbnail for this blog. It is about 2.5″ tall – maybe 3″ and was done quite easily with a brush. Ok, so that’s a little about technique but why make these letters instead of words? I like to make words with my letters. Last night I did a word piece because it seemed like I should have an example of that. I’m not much for life drawing though I’ve done a bit of it. 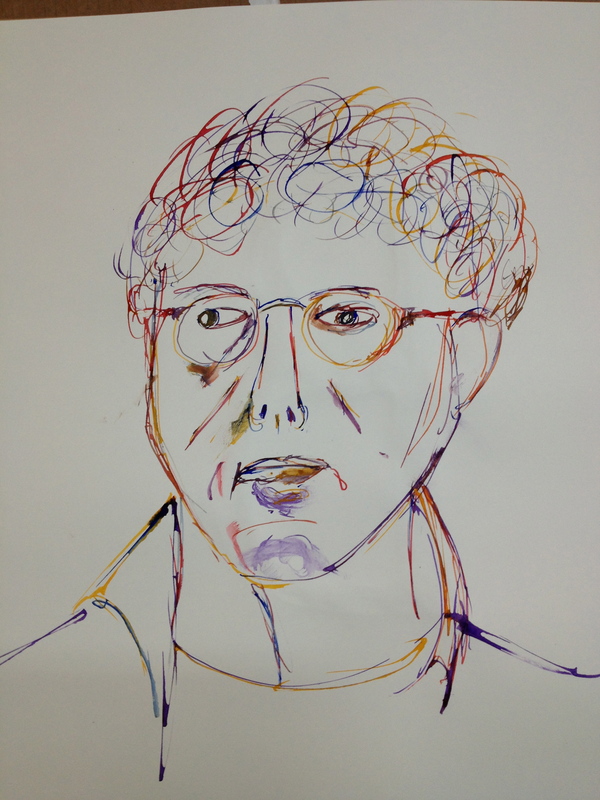 I decided to do a self-portrait in the style of Giacometti – but with my tools and colors. 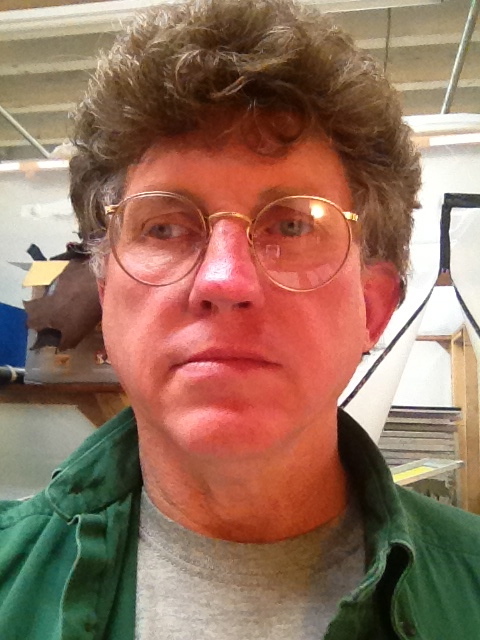 I didn’t really capture my own visage, but I think I got a bit of feeling in it. 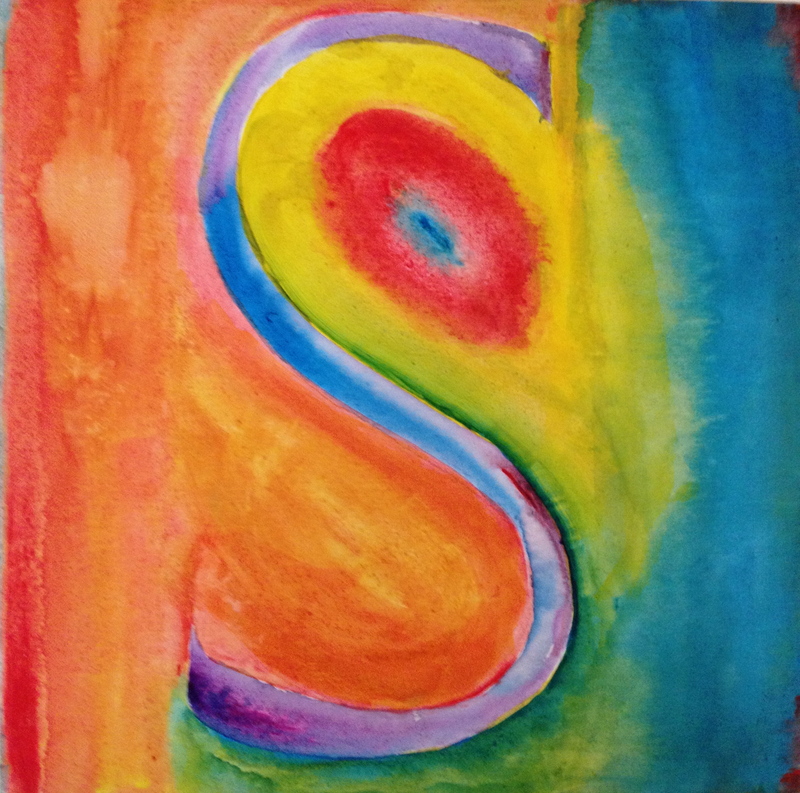 My quest is to portray each letter as if it had a personality of its own. 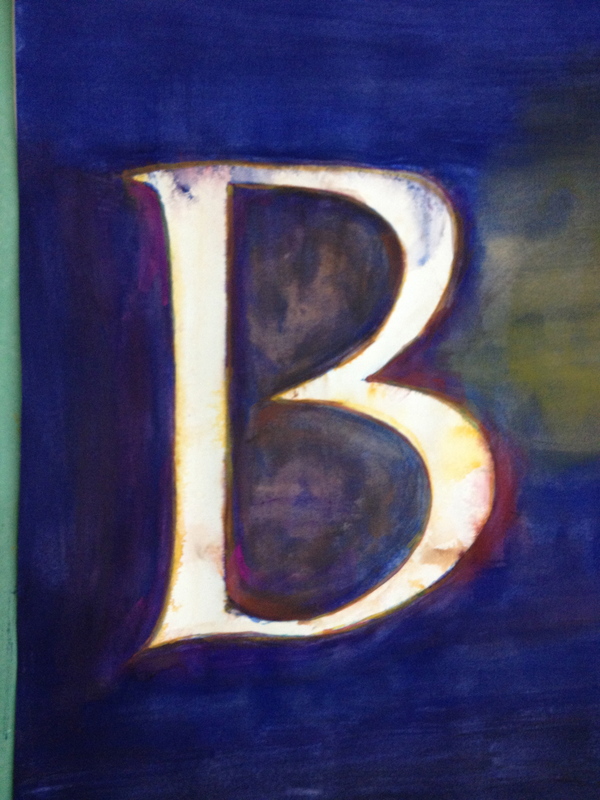 Painting these large letters are far more revealing than representational painting because I have been involved with letters in one form or another for about 40 years. I’ve done traditional calligraphy, typography, typesetting, graphic design, woodblock and letterpress printing. There’s always letters involved. Even if I do a woodblock image of something, there’s likely to be a letter or two in there. 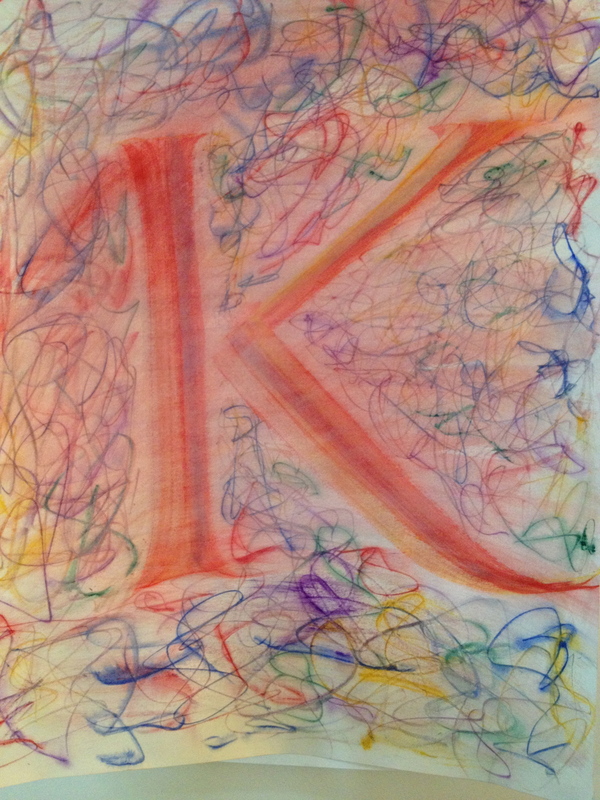 This portrait series is an attempt to focus on the personality of my letters. Or my personality through my letters.